The articles submitted for publication in the journal will be reviewed in the first stage by the technical staff of the editorial board for the preliminary formatting and corrections with respect to the usage of fonts, abstract preparation, experimental section, acknowledgements,conflicts of interest, copy rights, funding agencies, references etc. Once the basic format of the manuscript is stabilized it will be evaluated by the editorial review staffs at the preliminary stage. After the preliminary evaluation, the manuscript is ready for the double blind peer review which constitute the second stage of the editing process. The second stage peer review will be performed by a minimum of two peer reviewers and their review data will be collected in the review data form (RDF). According to the double blind review, the final decision about the article will be sent to the corresponding author for further proceedings. The journal is connected with CrossRef for their linking and reference checking services. Once the final accepted manuscripts are received at the editorial office they will be sent for publication. The abstracting work will be commenced immediately after the publication of the respective issue. All the authors will be informed about the date of publication of the respective issues, and rewarded with full journal in pdf copies and certificates. Authors are encouraged to register free to interact with the journal website. 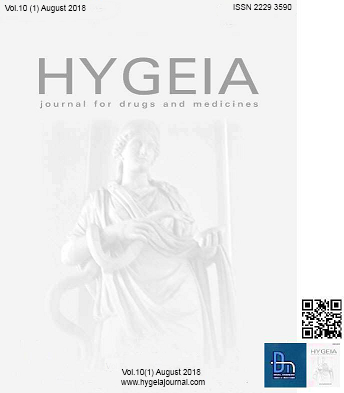 The articles published in Hygeia: journal for drugs and medicines are original and the data that has not been published or under consideration elsewhere. Manuscripts that are found to have been plagiarized from research data by other authors, whether published or unpublished, may face strict actions like rejection of the paper, or avoidance of the papers from these authors in the future etc. Also the falsification and fabrication of data obtained during a laboratory work, experimental schedule, etc. 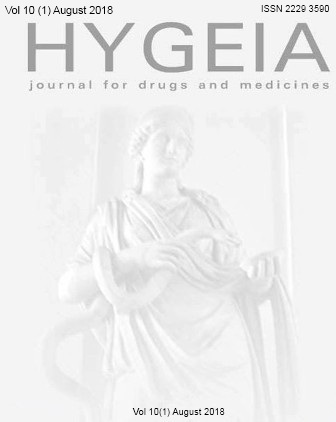 The Hygeiajournal editorial board is always against the duplication of published articles at any time. The duplication of previously published text by other authors, published images, photographs,diagrams etc in to a new manuscript may lead to immediate rejection by the first stage itself. Proper citations can be given every time to make one’s work legitimate and clean. 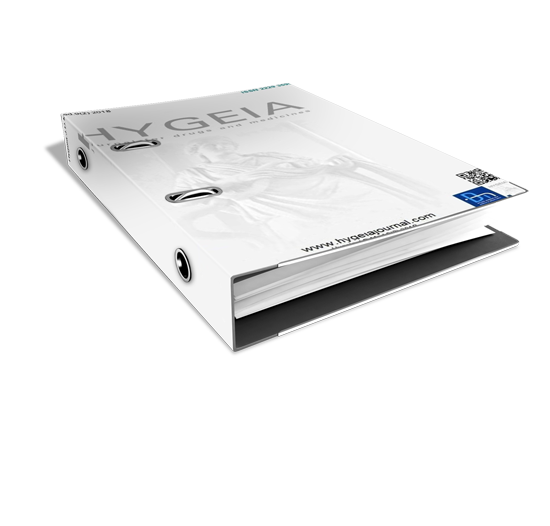 Normally the number of authors to be included in an article in Hygeiajournal is restricted to five and the number can be increased up to a maximum of seven if the corresponding author convinces by certification about the substantial contribution by all the other authors. We are having Manuscript Tracking System for the benefit of the authors which enable the writers to track the status of their submitted papers at any time, after log in to the website. Normally the scientific review of a paper may take up to one or two months. 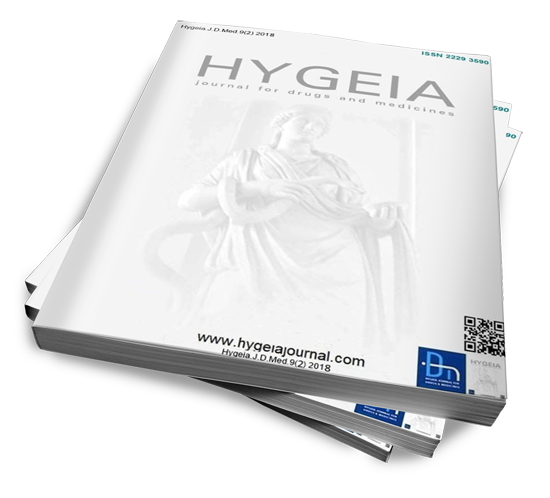 After receiving a manuscript, Hygeiajournal makes a blind review, by sending the paper to reviewers (2 or 3) at the same time. Normally a double blind reviewing procedure is followed for the assessment of a manuscript. The article status can be viewed as submitted, review on progress, accepted after minor /major revisions or rejected. The authors of manuscript may agree any conflicts of interest that, they have no associations with any organizations for any type of financial interest or non-financial interest with any data included or discussed in the this research paper. This statement must be signed by all the authors to agree that the informations are accurate and truthful. Authors may submit declaration and other supporting documents indicating that, the studies involving human subjects are in agreement with the Helsinki declaration of 1975 (revised in 2000) and approved by the Institutional Ethical Committee. Also the experiments with animals, involved in studies are strictly in accordance with the Institutional Animal Ethical Committee approved by the national Govt.agency for the care and use of laboratory animals.